Pilot talked to his friend in Alaska last night and it was warmer there than here. Met up with the family in Kville yesterday. had a nice seafood lunch. Today is ShyBoy's birthday. So burger birthday party this evening. I am charge of bringing burger patties. B and I are going to ride today. Winds are suppose to pick up again later this afternoon. Face I'm glad you got a good job on your paint project. I don't mind interior painting it is kind of fun. Exterior painting not so much. The worst though is drywall tape and float. And I really hate vacuuming. Everyone have a sunny Sunday! It has been an interesting week around here. I finally made some progress on the Imperial. It'll be ready to hit the road to Fawn Lodge this week. Decided to put plywood over the hole in the side. Changed out two tires, greased and inspected the bearings, both look great. Still have the other side to do. Have to get lights wired up and she'll be ready to hit the road for the first time in possibly forty years or more. The hitch is so light as to really worry me. Heavy hitch, good. Light hitch bad juju on a trailer! Most especially one this big. Speaking of the hitch, I replaced it yesterday. Nice new functional hitch and jack post too! My friend in Yellow Jacket Co. has cabinets and parts. He has a sink cabinet with stained glass where there is usually a wire screen. Looks really nice and I think is begging for back lighting. I really didn't need the sink cabinet as much as the drawer cabinet next to it, but what the heck? I'm supposed to have it out of there this coming week, and I'm not entirely sure I can. We shall see. Really looking forward to getting this old lady home and tear into her. She should be a real beauty once finished. Jmebear bought a new pony. Well, technically a miniature horse. Come to think of it, she has bought two! One is a rather plain little varnished grey who is Homozygous for the appaloosa pattern. She will be going down to the Sacramento area to pick her up in a week or so. The other is further south. She's spotty and cute, an inch smaller than Firefly at 33". Same colour combination, roaned chestnut with varnish marks and spots on a grey background. She has both of the colour genes and should throw beautiful colour with Fire. However, they will have to wait on that as she will be coming to us already in foal to the Previous Owner's stallion. We are obviously hoping for another filly. So far she has dropped two out of this stallion. So we might be making a trip down to Norco (about five or six miles from Dana) to pick her up. Jmebear is attempting to talk a friend into loaning us her two-horse for both trips. Either that or the 'Pony Express' through the Shetland Pony group. I love Norco and used to live across the river in Mira Loma, so it will be a bit like going home for me. Kind of a bittersweet holiday. That and my son lives in Riverside. It would be nice to see him. Before I can go though, we have to arrange someone to watch the Walkingbear. Plenty of time to arrange for it as this mare won't be ready to go till May or June. I hope no later as Riverside/Norco is brutally hot in the Summer. Well, I have to let Socks and the boys out in the neighbor's paddock. They've a bit of barn-fever due to all this rain and could use some running around. Sunday, the storm was coming and looked impressive. Tornado watches were issued. It was to hit at 4PM. So we decided to feed horses early. Afterwards, looking at the radar, the part that came over us totally fell apart. Barely a sprinkle. At dinner time horses get tied to trees to eat when they are away from the barn to ensure each gets their fair share. Spirit did not like this but Sunda was her 3rd dinner being tied to a tree and she was finally calm and figured out how this works. For breakfast it is a free for all. Believe it or not even California is not immune to Tornadoes. However, I am very glad to say, rarely does the funnel cloud touch down and do much of any damage. One of my favourite places in the country is Kentucky and it's Tornado Alley! Texas is having their share this month too! Do take care, all of you and keep safe! May our gracious Lord protect all of you and your loved ones, two and four legged! Sad news today. A great lady has been lost. 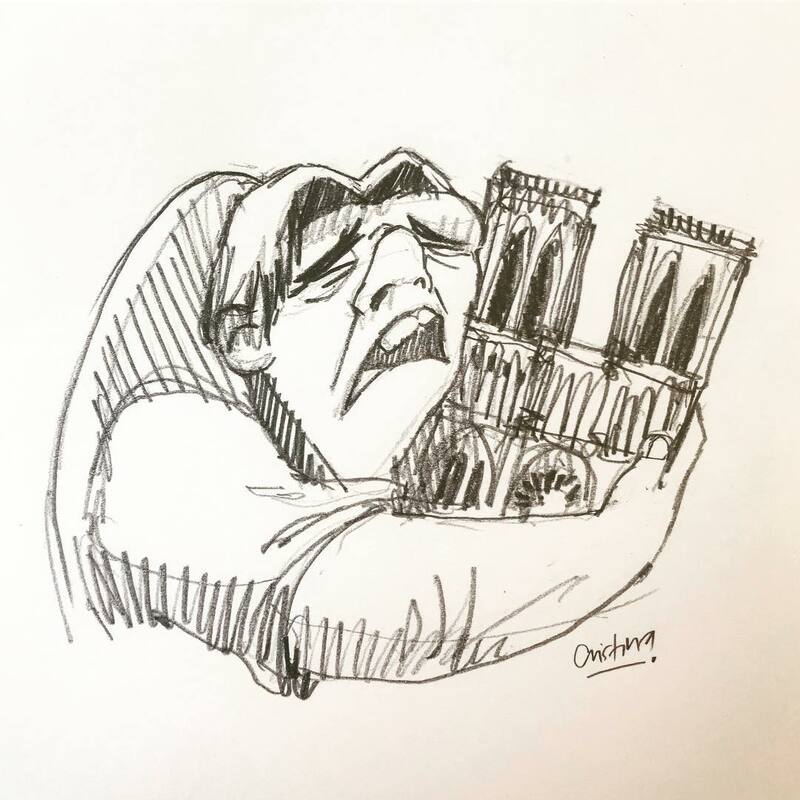 It appears Notre Dame Cathedral in Paris has succumbed to a fire. RIP dear and beloved heart of Paris!